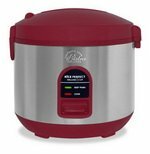 Rice cookers are a great way to cook perfect rice in large quantities without having to watch a pot to prevent it from potentially boiling over. This convenient kitchen tool has a basic design, with a heating unit and removable cooking pot inside of a closed unit that has a lid. The cooker has electronics that allow you to operate the unit. The great thing about these units is that they shut off automatically when the cooker has completed cooking the rice. The unit senses that the rice is finished cooking by using moisture and heat sensors. Some cookers even have warming units for keeping the rice warm after it has finished cooking, and will automatically switch to this mode once cooking is done. Although many rice cookers are designed to cook only rice, more advanced models have other features such as steamer baskets for cooking such foods as vegetables. These units generally sit on top of the rice pot. There are various capacities and sizes, with the capacity referring to the amount of cooked rice that you can get from the pot. Therefore, if you add 3 cups of uncooked rice you will generally get more than 6 cups of cooked rice, the amount of cooked rice is generally more than double what is added uncooked. These kitchen tools can be purchased in anywhere from a 3 cup to over 10 cup capacity, and since the finished rice will be more than double what you put in, for many persons less than a 10 cup capacity cooker will meet their needs unless you are constantly cooking for either a large family or large gathering. Generally it is easy to measure the amount of rice that is added by looking at the measurement lines on the inside liner of the rice pot. There are also standards for how much rice to water should be added, generally one cup of rice requires 1 ½ cups of water, but the water to rice ratio is also dependent on the type of rice, with rice such as brown rice or long grained rice requiring a different amount of water. Brown rice actually needs to cook longer and will require more water. Rice should also be rinsed prior to putting it in the cooker to remove the starches that cause rice to be sticky, that will also help to turn out perfect rice. The best way to handle the cooking of rice is to wash the rice, put some oil around the cooking liner, add the rice, put in sufficient water, start the cooking process and leave it alone, there is no need to stir the rice, and it will cook perfectly when left on its own. Depending upon the features and size of the rice cookers, these cookers can range from inexpensive in the range of a little over $20 to quite expensive well over $300.